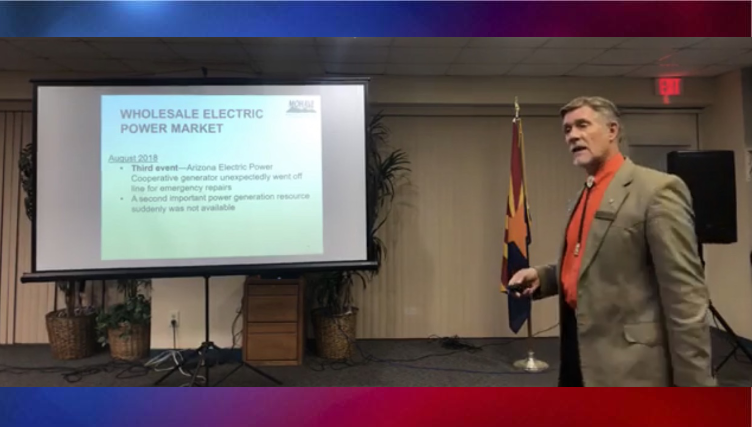 BULLHEAD CITY–Mohave Electric Cooperative told customers during a town hall Thursday that unforeseen power shortages during the summer led to multi-million dollar costs for the electric company outlet. Outages caused by summer events reportedly forced Mohave Electric Cooperative to purchase power at a higher rate than anticipated in the wholesale power market. As a result, the savings MEC worked diligently to pass on to members in the Purchased Power Adjustor will be reduced. Several events resulted in a price surge: an energy shortage in California and the Arizona Electric Power Cooperative’s generator unexpectedly going offline for emergency repairs. The shortage in California resulted in power producers from Arizona and Nevada selling at a higher rate, resulting in the most expensive two-month period for MEC in nearly 20 years. In the same time frame, the AEPCO generator went offline and MEC lost an important power resource. The result left MEC with an unanticipated $3-4 million expense. The Purchase Power Adjustor, required by the Arizona Corporation Commission as a way to adjust for purchased power variances not included in the energy rate, has been a 1.5 cents credit per kilowatt-hour. The result of the increased cost will mean the credit will be reduced to .75 cents per kwh beginning in January, leading to an average increase of about $7. Although the PPA is subject to change, when conditions are favorable, savings are passed along to members. Carlson explained the credit reduction is not a rate increase. Because MEC is not-for-profit, rates are set to cover the cost of doing business and are not marked up to make a profit. Any margins left at the end of the year are allocated to members as capital credits. Carlson answered questions from the audience during the informative session held at the Bullhead Area Chamber of Commerce in Bullhead City. He also stressed that energy efficiency can help reduce costs of electric to members. In addition, the cooperative offers programs to assist low income residents.